Medtronic is buying Covidien in a tax-friendly move, but here are three other reasons the deal makes sense. Medtronic's (NYSE:MDT) purchase of Covidien (UNKNOWN:COV.DL) will save the company millions annually in taxes once the two companies are combined under a newly created Irish shell, but that's not the only reason Medtronic is buying Covidien. The two companies have big and growing businesses that complement one another, too. Here are three other reasons the deal makes sense, and how these opportunities could affect the business. Medtronic and Covidien have been bulking up their emerging markets operation to benefit from growing health care spending in developing nations. As a result, the combination creates a medtech company with roughly $4 billion in emerging market sales that's growing at a mid-teens percentage clip. Since Covidien's surgical tools are one of the first purchases made by new hospitals, Medtronic should be able to leverage Covidien's existing relationships to expand demand for its implantable devices. Currently, Covidien does business in 150 countries, 10 more than Medtronic, suggesting there's some greenfield opportunity in additional markets, too. However, those additional markets pale in comparison to China, which will remain the largest emerging market opportunity for the newly combined company going forward. According to research firm McKinsey, China's health care spending is expected to triple between 2011 and 2020 as China's population ages, health care innovates, and the country embarks on a massive health care reform program. There are more than 13,500 public hospitals in China, and China is easing regulations on foreign ownership in a bid to significantly increase the availability of care. China's ambitious universal health care plan has already significantly increased the percentage of its people receiving some form of public health insurance from 30% in 2003 to more than 90% today. That's led to a doubling in the use of hospitals in rural communities. As care becomes increasingly affordable (and available), demand for Covidien and Medtronic products should grow. That demand growth should help emerging markets' revenue climb, but emerging market profitability could also benefit from the deal given that the two should be able to remove manufacturing overlap in those markets, too. Covidien's product line builds out Medtronic's product line up both vertically and horizontally. Covidien's peripheral vascular business will fit nicely into Medtronic's cardiovascular group, and Covidien's neurovascular offering will slide in under Medtronic's neurosciences unit. Over time, Medtronic could see developing next-generation Covidien tools more uniquely tailored to Medtronic's lineup. The remaining pieces of Covidien's product line, such as patient monitoring and respiratory critical care, will be horizontally integrated into Medtronic, broadening its product line-up and giving their combined sales teams more overall products to cross-sell. Medtronic will also use its significant experience in ushering class III medical products through regulatory hurdles to help advance lung cancer, gastrointestinal, and embolic stroke products currently in Covidien's R&D pipeline. Potential tax savings aside, Medtronic thinks the newly combined company can deliver $850 million in back office and supply chain cost synergies over the next few years. Medtronic thinks the company could even over-deliver on its $850 million savings forecast given that number had been risk-adjusted lower from original internal estimates at both companies. That will boost margins even as sales are projected to continue climbing in the mid single-digit percentages. As a result, Medtronic estimates the deal will be accretive to cash earnings in fiscal year 2016, and significantly accretive thereafter. 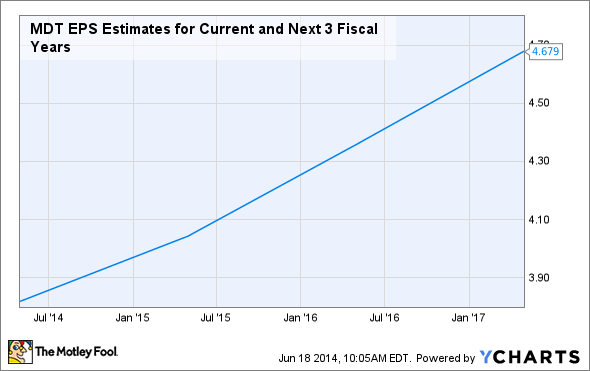 That's led Wells Fargo analysts to bump up 2016 estimates by 3%, and 2017 estimates by 7%. MDT EPS Estimates for Current and Next 3 Fiscal Years data by YCharts. The improving bottom line and the flexibility associated with recapturing some of the cash currently trapped overseas could allow Medtronic to boost shareholder-friendly programs, including dividends and buybacks. "As I communicated to many of you [in] the past, we would love to take a look at our shareholder returns, especially the dividend aspect, if we had more flexibility; we have more flexibility now," said Medtronic's CFO Gary Ellis at a recent investor conference.